5 ways to make a difference! 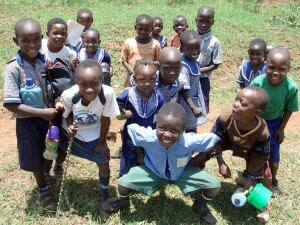 Ugandan children on their way to school. Celebrate International Development Week with CFTC! Every year at the beginning of February, we celebrate International Development Week: a time for Canadians within and outside the development sector to come together and share our achievements, talk about challenges, and take concrete action. Or as we at CFTC like to say, create a world where children thrive. Here are five great ideas that we hope will inspire you to take action and – even more importantly – to share far and wide. Please help us spread the word about how together we are making a difference! 1. READ the Gates Foundation’s Annual Letter: Three Myths That Block Progress for the Poor. Understand more about the amazing achievements made at improving the health and well-being of the world’s poorest people, and get ready to bust those myths next time you hear them! 2. WATCH the Department of Foreign Affairs, Trade & Development’s video on food security to learn more about the tremendously important work funded through Canada’s international aid budget, Canadian Feed The Children, and other development agencies. Imagine what the world would be like without that help. 3. SIGN ONE’s petition to show your support for maintaining Canada’s strong commitment to aid in the upcoming federal budget – so that we can keep doing what we all know needs to be done. 4. SIGN UP FOR CFTC’s enewsletter (see the link on the right of this page —>) to stay up-to-date with stories about the children, women and men whose lives you are making better by supporting Canadian Feed The Children and our local partners in Ghana, Uganda, Ethiopia, Bolivia, Haiti and right here in Canada too. 5. SHARE this blog post by email and on social media to spread the word about the difference Canadians can continue to make around the world all year long!